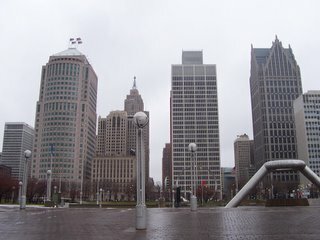 I spent New Year’s Eve in Detroit. Yes, I can hear the jealousy rising up in all of you. It started when I woke up with Toledo and we were debating where to spend the day. We half-jokingly contemplated driving to NYC and Times Square, high on the lifetime To Do List for both of us, but nixed the idea quickly. I offered a meager substitute in the newly refurbished downtown Detroit. I’d been itching to get down there for a while to do some location scouting for the new book and she’d never been. After deciding that’s what we were going to do, we began packing and during this process, she talked her mom into going with us. Soon after she was on the phone with her dad and he expressed interest in coming. That took us from drivers to passengers which was nice indeed, even though I do tend to get a bit queasy riding in cars. Not long after her sister woke and also wanted in on the fun, so around 1pm we all piled in a car with Ohio plates and headed up I-75 North. I mostly come into Detroit via I-75 south so it was a new experience for me coming up through the southern suburbs and the downriver area which was neat. We parked near the new Campus Martius Park area and the Compuware headquarters building where there is a Borders and Hardrock Cafe. Touristy indeed. 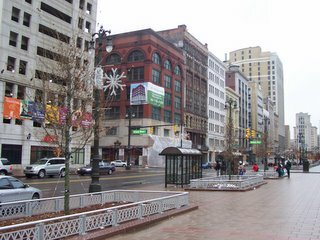 It was amazing to see people downtown Detroit on a rainy holiday Saturday in an area that was formerly a wasteland. 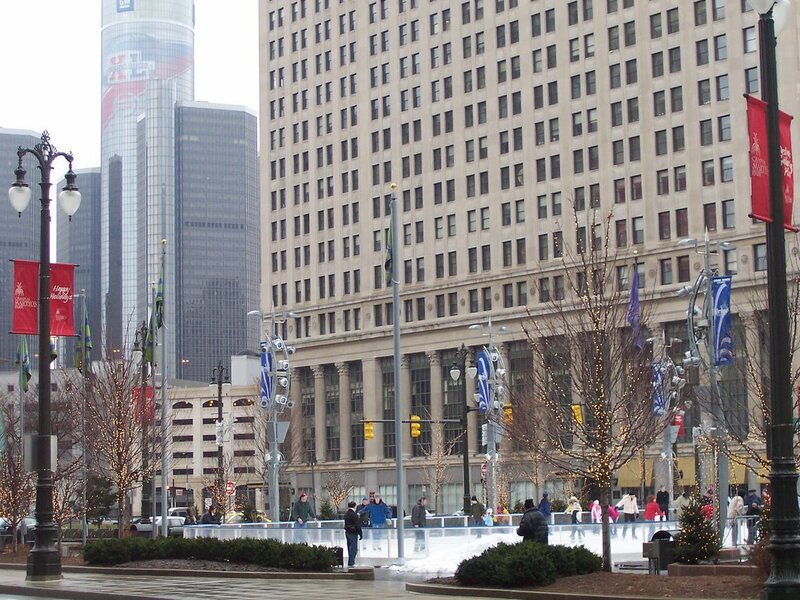 We started at the Campus Martius Park where a smaller version of Rockefeller Center had popped up. From there we headed down Woodward Avenue to Hart Plaza and the Riverwalk. The skyline view is taken from Hart Plaza with the Detroit River to my back. 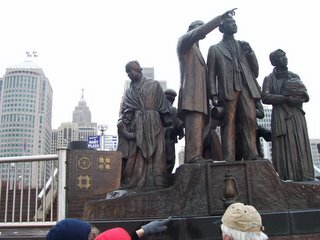 The statue is an Underground Railroad monument because slaves were regularly transported across the short border to Canada. Many years later, millions of gallons of illegal booze would follow the same path. I’m still waiting for that monument. 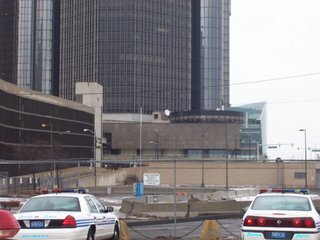 This parking lot behind the Renaissance Center is where the first body drops in my second novel, HONORABLE SCARS. The police cars are not normally there. After Hart Plaze we moved back down Woodward where this wonderful Chrsitmas view of the street was balanced by the stretch closer to Michigan Avenue which is still a bit gritty. My PI Dallas Ellington will have several client meetings at the Woodward Coney Island, I’m sure, if it manages to survive the renewal. 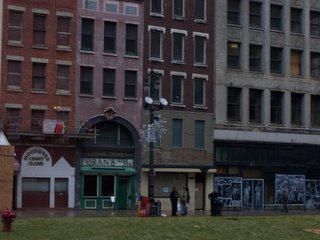 Many of the once vacant buildings are under construction for lofts and restaurants and shops. There are still corners though that resemble the Detroit I once knew. 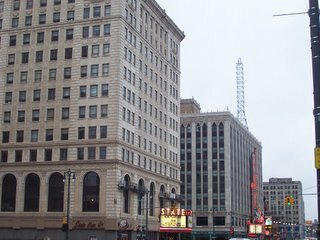 Moving further down Woodward Avenue away from Hart Plaza, you come upon the invigorated theater district and it’s crown jewel the Fox Theater. 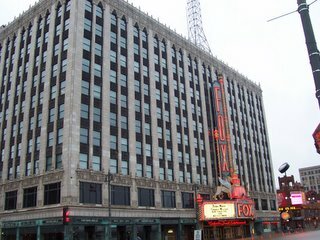 The building next to the Fox is the State Theater, a great live music venue. The Fox theater is regularly the top grosser in ticket revenue beating out its larger rival Radio City Music Hall. I saw Grease at the Fox. It sucked. Bad. But I liked the theater. Dallas Ellington and his partner Steve Vaughn run Saturday Morning Investigations out of their office in the Fox Theater Building. Ellington’s office is right by the F on the seventh floor. 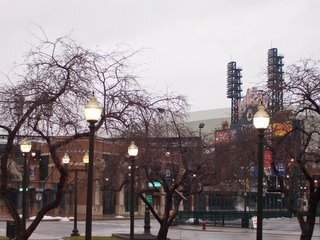 A couple of streets over from the Fox is the Grand Circus Park district, another former wasteland and drug den seeing new life thanks to Ford Field (Detroit Lions) and Comerica park (Detroit Tigers). 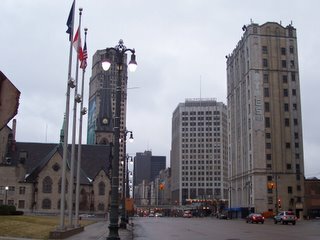 One of the saddest of all the many deserted skyscrapers in Detroit is the David Broderick Tower. 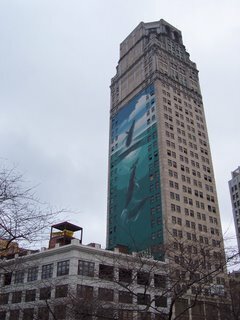 On the back of the building, viewable from Comerica Park, is a grogeous mural of a humpback whale. This building may get a revival though, a new owner plans on building condos in the gorgeous building. He’s asked the city for persmission to cover the mural with an advertisement to help fund the cost of the remodeling. Large ads are popping up all over downtown as the city sees more and more foottraffic which is a great sign. We end our tour with a view back down Woodward Avenue from the Fox Theater Building.